Booster is America's premier fundraising company for elementary schools. * Nearly 2 million students will experience a Boosterthon Fun Run this year. *How do I know? Because I worked there for 11 years. They really are the best. Booster had accumulated a massive archive of relics from nearly two decades of history. Photos, posters, t-shirts, and all kinds of memorabilia filled about a dozen boxes in the company's warehouse. 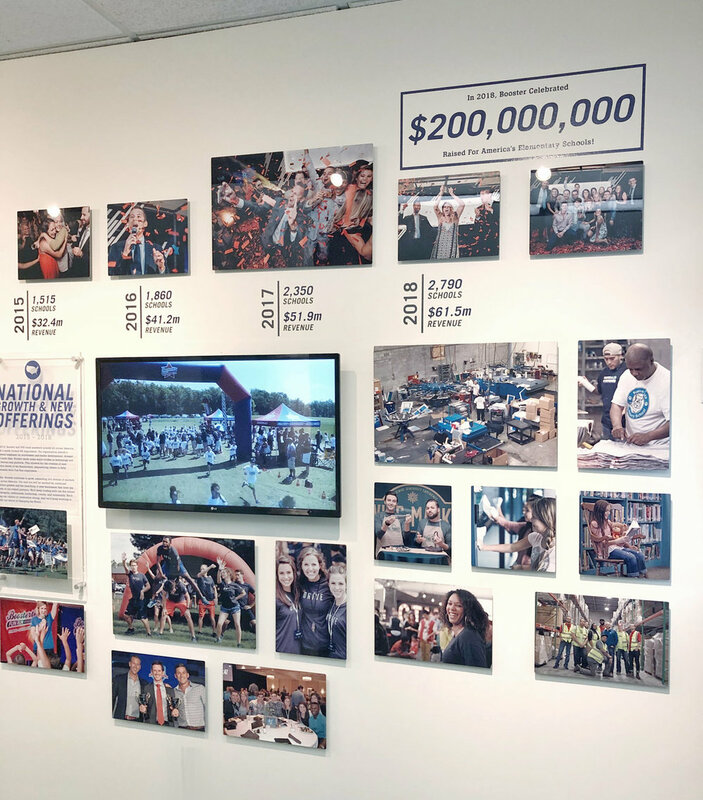 In 2018, they wanted to use the items to create a historical display that would showcase significant moments and mementos from the past. I sorted through the archives and then designed a master layout. The display would be installed on a 37-foot wall inside the company's home office. The layout called for a linear timeline showing four eras of the company's past. I had photos digitized and transposed onto aluminum panels with float mounts. Other interesting historical items were salvaged and prepped for installation. The installation is introduced with a 52-inch long piece of string art. Then I integrated a few relics from the company's early years, including the founder's original megaphone and a vintage ipod. The rest of the timeline is comprised of metal pictures, acrylic info plaques, digital monitors, and wall vinyls. The final feature is a neon sign with the phrase "Just Getting Started." This is meant to leave the viewer with a sense of the company's future and not just its past. The neon sign is surrounded by bright red coffee mugs. After a Booster team member finishes giving a tour to a guest, they present them with a mug bearing the company's iconic "Change the World" logo and vision statement.